Treatment of Pagetâ€™s disease (1.4). 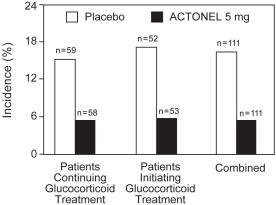 ACTONEL is indicated for the treatment and prevention of glucocorticoid-induced osteoporosis in men and women who are either initiating or continuing systemic glucocorticoid treatment (daily dosage of â‰¥ 7.5 mg prednisone or equivalent) for chronic diseases. Patients treated with glucocorticoids should receive adequate amounts of calcium and vitamin D.
ACTONEL is indicated for treatment of Pagetâ€™s disease of bone in men and women. Patients should receive supplemental calcium and vitamin D if dietary intake is inadequate [see Warnings and Precautions (5.2)]. Calcium supplements and calcium-, aluminum-, and magnesium-containing medications may interfere with the absorption of ACTONEL and should be taken at a different time of the day. ACTONEL is not recommended for use in patients with severe renal impairment (creatinine clearance <30 mL/min). No dosage adjustment is necessary in patients with a creatinine clearance â‰¥30 mL/min or in the elderly. ACTONEL, like other bisphosphonates administered orally, may cause local irritation of the upper gastrointestinal mucosa. 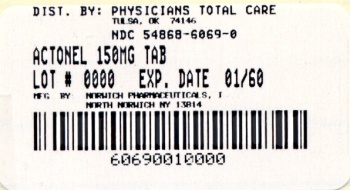 Because of these possible irritant effects and a potential for worsening of the underlying disease, caution should be used when ACTONEL is given to patients with active upper gastrointestinal problems (such as known Barrettâ€™s esophagus, dysphagia, other esophageal diseases, gastritis, duodenitis or ulcers) [see Contraindications (4), Adverse Reactions (6.1), Information for Patients (17.1)]. Hypocalcemia and other disturbances of bone and mineral metabolism should be effectively treated before starting ACTONEL therapy. Adequate intake of calcium and vitamin D is important in all patients, especially in patients with Pagetâ€™s disease in whom bone turnover is significantly elevated [see Contraindications (4), Adverse Reactions (6.1), Information for Patients (17.1)]. The incidence of all-cause mortality was 2.0% in the placebo group and 1.7% in the ACTONEL 5 mg daily group. The incidence of serious adverse events was 24.6% in the placebo group and 27.2% in the ACTONEL 5 mg group. The percentage of patients who withdrew from the study due to adverse events was 15.6% in the placebo group and 14.8% in the ACTONEL 5 mg group. Table 1 lists adverse events from the Phase 3 postmenopausal osteoporosis trials reported in â‰¥5% of patients. Adverse events are shown without attribution of causality. The safety of ACTONEL 5 mg daily in the treatment and prevention of glucocorticoid-induced osteoporosis was assessed in two randomized, double-blind, placebo-controlled multinational trials of 344 patients [male (123) and female (221)] aged 18 to 85 years who had recently initiated oral glucocorticoid therapy (â‰¤ 3 months, prevention study) or were on long-term oral glucocorticoid therapy (â‰¥ 6 months, treatment study). The duration of the trials was one year, with 170 patients exposed to placebo and 174 patients exposed to ACTONEL 5 mg daily. Patients in one study received 1000 mg elemental calcium plus 400 IU of vitamin D supplementation per day; patients in the other study received 500 mg calcium supplementation per day. ACTONEL has been studied in 392 patients with Pagetâ€™s disease of bone. As in trials of ACTONEL for other indications, the adverse experiences reported in the Pagetâ€™s disease trials have generally been mild or moderate, have not required discontinuation of treatment, and have not appeared to be related to patient age, gender, or race. The safety of ACTONEL was assessed in a randomized, double-blind, active-controlled study of 122 patients aged 34 to 85 years. 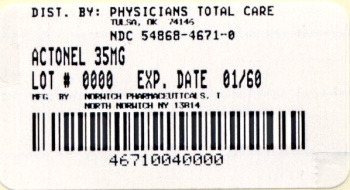 The duration of the trial was 540 days, with 61 patients exposed to ACTONEL and 61 patients exposed to Didronel. The adverse event profile was similar for ACTONEL and Didronel: 6.6% (4/61) of patients treated with ACTONEL 30 mg daily for 2 months discontinued treatment due to adverse events, compared to 8.2% (5/61) of patients treated with Didronel 400 mg daily for 6 months. Table 2 lists adverse events reported in â‰¥5% of ACTONEL-treated patients in Phase 3 Paget's disease trials. Adverse events shown are considered to be possibly or probably causally related in at least one patient. The safety and effectiveness of risedronate was assessed in a one-year, randomized, double-blind, placebo controlled study of 143 pediatric patients (94 received risedronate) with osteogenesis imperfecta (OI). The enrolled population was predominantly patients with mild osteogenesis imperfecta (85% Type-I), aged 4 to <16 years, 50% male and 82% Caucasian, with a mean lumbar spine BMD Z-score of -2.08 (2.08 standard deviations below the mean for age-matched controls). Patients received either a 2.5 mg (â‰¤30 kg body weight) or 5 mg (>30 kg body weight) daily oral dose. After one year, an increase in lumbar spine BMD in the risedronate group compared to the placebo group was observed. However, treatment with risedronate did not result in a reduction in the risk of fracture in pediatric patients with osteogenesis imperfecta. In ACTONEL-treated subjects, no mineralization defects were noted in paired bone biopsy specimens obtained at baseline and month 12. The overall safety profile of risedronate in OI patients treated for up to 12 months was generally similar to that of adults with osteoporosis. However, there was an increased incidence of vomiting compared to placebo. In this study, vomiting was observed in 15% of children treated with risedronate and 6% of patients treated with placebo. Other adverse events reported in â‰¥10% of patients treated with risedronate and with a higher frequency than placebo were: pain in the extremity (21% with risedronate versus 16% with placebo), headache (20% versus 8%), back pain (17% versus 10%), pain (15% versus 10%), upper abdominal pain (11% versus 8%), and bone pain (10% versus 4%). Of the patients receiving ACTONEL in postmenopausal osteoporosis studies [see Clinical Studies (14)], 47% were between 65 and 75 years of age, and 17% were over 75. The corresponding proportions were 26% and 11% in glucocorticoid-induced osteoporosis trials, and 40% and 26% in Pagetâ€™s disease trials. No overall differences in efficacy between geriatric and younger patients were observed in these studies. In the male osteoporosis trial, 28% of patients receiving ACTONEL were between 65 and 75 years of age and 9% were over 75. The lumbar spine BMD response for ACTONEL compared to placebo was 5.6% for subjects <65 years and 2.9% for subjects â‰¥65 years. No overall differences in safety between geriatric and younger patients were observed in the ACTONEL trials, but greater sensitivity of some older individuals cannot be ruled out. ACTONEL is not recommended for use in patients with severe renal impairment (creatinine clearance <30 mL/min) because of lack of clinical experience. No dosage adjustment is necessary in patients with a creatinine clearance â‰¥30 mL/min. No studies have been performed to assess risedronateâ€™s safety or efficacy in patients with hepatic impairment. Risedronate is not metabolized in human liver preparations. Dosage adjustment is unlikely to be needed in patients with hepatic impairment. Dose strength-specific ingredients include: 5 mgâ€”ferric oxide yellow, lactose monohydrate; 30 mgâ€”lactose monohydrate; 35 mgâ€”ferric oxide red, ferric oxide yellow, lactose monohydrate; 75 mgâ€”ferric oxide red; 150 mgâ€”FD&C blue #2 aluminum lake. ACTONEL treatment decreases the elevated rate of bone turnover that is typically seen in postmenopausal osteoporosis. In clinical trials, administration of ACTONEL to postmenopausal women resulted in decreases in biochemical markers of bone turnover, including urinary deoxypyridinoline/creatinine and urinary collagen cross-linked N-telopeptide (markers of bone resorption) and serum bone-specific alkaline phosphatase (a marker of bone formation). At the 5 mg dose, decreases in deoxypyridinoline/creatinine were evident within 14 days of treatment. Changes in bone formation markers were observed later than changes in resorption markers, as expected, due to the coupled nature of bone resorption and bone formation; decreases in bone-specific alkaline phosphatase of about 20% were evident within 3 months of treatment. Bone turnover markers reached a nadir of about 40% below baseline values by the sixth month of treatment and remained stable with continued treatment for up to 3 years. Bone turnover is decreased as early as 14 days and maximally within about 6 months of treatment, with achievement of a new steady-state that more nearly approximates the rate of bone turnover seen in premenopausal women. In a 1-year study comparing daily versus weekly oral dosing regimens of ACTONEL for the treatment of osteoporosis in postmenopausal women, ACTONEL 5 mg daily and ACTONEL 35 mg once-a-week decreased urinary collagen cross-linked N-telopeptide by 60% and 61%, respectively. In addition, serum bone-specific alkaline phosphatase was also reduced by 42% and 41% in the ACTONEL 5 mg daily and ACTONEL 35 mg once-a-week groups, respectively. When postmenopausal women with osteoporosis were treated for 1 year with ACTONEL 5 mg daily or ACTONEL 75 mg two consecutive days per month, urinary collagen cross-linked N-telopeptide was decreased by 54% and 52%, respectively, and serum bone-specific alkaline phosphatase was reduced by 36% and 35%, respectively. In a 1â€“year study comparing ACTONEL 5 mg daily versus ACTONEL 150 mg once a month in women with postmenopausal osteoporosis, urinary collagen cross-linked N-telopeptide was decreased by 52% and 49%, respectively, and serum bone-specific alkaline phosphatase was reduced by 31% and 32%, respectively. Pagetâ€™s disease of bone is a chronic, focal skeletal disorder characterized by greatly increased and disordered bone remodeling. Excessive osteoclastic bone resorption is followed by osteoblastic new bone formation, leading to the replacement of the normal bone architecture by disorganized, enlarged, and weakened bone structure. Renal Impairment: Risedronate is excreted unchanged primarily via the kidney. As compared to persons with normal renal function, the renal clearance of risedronate was decreased by about 70% in patients with creatinine clearance of approximately 30 mL/min. ACTONEL is not recommended for use in patients with severe renal impairment (creatinine clearance <30 mL/min) because of lack of clinical experience. No dosage adjustment is necessary in patients with a creatinine clearance â‰¥30 mL/min. Hepatic Impairment: No studies have been performed to assess risedronateâ€™s safety or efficacy in patients with hepatic impairment. 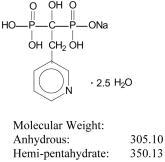 Risedronate is not metabolized in rat, dog, and human liver preparations. Insignificant amounts (<0.1% of intravenous dose) of drug are excreted in the bile in rats. Therefore, dosage adjustment is unlikely to be needed in patients with hepatic impairment. Fractures of previously undeformed vertebrae (new fractures) and worsening of pre-existing vertebral fractures were diagnosed radiographically; some of these fractures were also associated with symptoms (i.e., clinical fractures). Spinal radiographs were scheduled annually and prospectively planned analyses were based on the time to a patientâ€™s first diagnosed fracture. The primary endpoint for these studies was the incidence of new and worsening vertebral fractures across the period of 0 to 3 years. ACTONEL 5 mg daily significantly reduced the incidence of new and worsening vertebral fractures and of new vertebral fractures in both VERT NA and VERT MN at all time points (Table 3). The reduction in risk seen in the subgroup of patients who had 2 or more vertebral fractures at study entry was similar to that seen in the overall study population. The effects of ACTONEL 35 mg once-a-week on BMD were examined in a 2-year, double-blind, placebo-controlled, multinational study in 285 men with osteoporosis (ACTONEL, N = 192). The patients had a mean age of 60.6 years (range 36 to 84 years) and 95% were Caucasian. At baseline, mean lumbar spine T-score was -3.2 and mean femoral neck T-score was -2.4. All patients in the study had either, 1) a BMD T-score â‰¤-2 at the femoral neck and â‰¤-1 at the lumbar spine, or 2) a BMD T-score â‰¤-1 at the femoral neck and â‰¤-2.5 at the lumbar spine. All patients were supplemented with calcium 1000 mg/day and vitamin D 400 to 500 IU/day. ACTONEL 35 mg once-a-week produced significant mean increases in BMD at the lumbar spine, femoral neck, trochanter, and total hip compared to placebo after 2 years of treatment (treatment difference: lumbar spine, 4.5%; femoral neck, 1.1%; trochanter, 2.2%; total proximal femur, 1.5%). Two 1-year, double-blind, placebo-controlled trials in patients who were taking â‰¥7.5 mg/day of prednisone or equivalent demonstrated that ACTONEL 5 mg daily was effective in the prevention and treatment of glucocorticoid-induced osteoporosis in men and women who were either initiating or continuing glucocorticoid therapy. The efficacy of ACTONEL therapy for glucocorticoid-induced osteoporosis beyond one year has not been studied. The prevention study enrolled 228 patients (ACTONEL 5 mg, N = 76) (18 to 85 years of age), each of whom had initiated glucocorticoid therapy (mean daily dose of prednisone 21 mg) within the previous 3 months (mean duration of use prior to study 1.8 months) for rheumatic, skin, and pulmonary diseases. The mean lumbar spine BMD was normal at baseline (average T-score -0.7). All patients in this study received supplemental calcium 500 mg/day. By the third month of treatment, and continuing through the year-long treatment, the placebo group experienced losses in BMD at the lumbar spine, femoral neck, and trochanter, while BMD was maintained or increased in the ACTONEL 5 mg group. At each skeletal site there were statistically significant differences between the placebo group and the ACTONEL 5 mg group at all timepoints (Months 3, 6, 9, and 12). The treatment differences increased with continued treatment. Although BMD increased at the distal radius in the ACTONEL 5 mg group compared to the placebo group, the difference was not statistically significant. 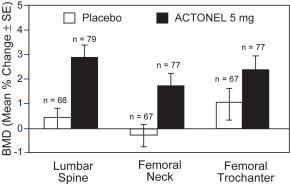 The differences between placebo and ACTONEL 5 mg after 1 year were 3.8% at the lumbar spine, 4.1% at the femoral neck, and 4.6% at the trochanter, as shown in Figure 3. The results at these skeletal sites were similar to the overall results when the subgroups of men and postmenopausal women, but not premenopausal women, were analyzed separately. ACTONEL was effective at the lumbar spine, femoral neck, and trochanter regardless of age (<65 vs. â‰¥65), gender, prior and concomitant glucocorticoid dose, or baseline BMD. Positive treatment effects were also observed in patients taking glucocorticoids for a broad range of rheumatologic disorders, the most common of which were rheumatoid arthritis, temporal arteritis, and polymyalgia rheumatica. The treatment study of similar design enrolled 290 patients (ACTONEL 5 mg, N = 100) (19 to 85 years of age) with continuing, long-term (â‰¥6 months) use of glucocorticoids (mean duration of use prior to study 60 months; mean daily dose of prednisone 15 mg) for rheumatic, skin, and pulmonary diseases. The baseline mean lumbar spine BMD was low (1.63 SD below the young healthy population mean), with 28% of the patients more than 2.5 SD below the mean. All patients in this study received supplemental calcium 1000 mg/day and vitamin D 400 IU/day. After 1 year of treatment, the BMD of the placebo group was within ±1% of baseline levels at the lumbar spine, femoral neck, and trochanter. 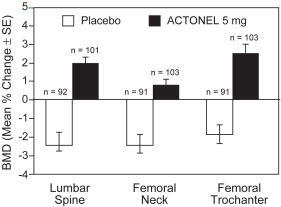 ACTONEL 5 mg increased BMD at the lumbar spine (2.9%), femoral neck (1.8%), and trochanter (2.4%). 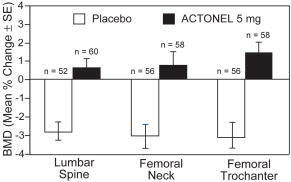 The differences between ACTONEL and placebo were 2.7% at the lumbar spine, 1.9% at the femoral neck, and 1.6% at the trochanter as shown in Figure 4. The differences were statistically significant for the lumbar spine and femoral neck, but not at the femoral trochanter. ACTONEL was similarly effective on lumbar spine BMD regardless of age (<65 vs. â‰¥65), gender, or pre-study glucocorticoid dose. Positive treatment effects were also observed in patients taking glucocorticoids for a broad range of rheumatologic disorders, the most common of which were rheumatoid arthritis, temporal arteritis, and polymyalgia rheumatica. 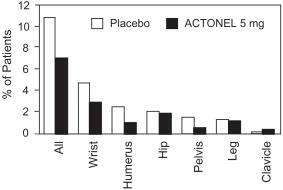 The efficacy of ACTONEL was demonstrated in 2 clinical studies involving 120 men and 65 women. In a double-blind, active-controlled study of patients with moderate-to-severe Pagetâ€™s disease (serum alkaline phosphatase levels of at least 2 times the upper limit of normal), patients were treated with ACTONEL 30 mg daily for 2 months or Didronel® (etidronate disodium) 400 mg daily for 6 months. At Day 180, 77% (43/56) of ACTONEL-treated patients achieved normalization of serum alkaline phosphatase levels, compared to 10.5% (6/57) of patients treated with Didronel (p<0.001). 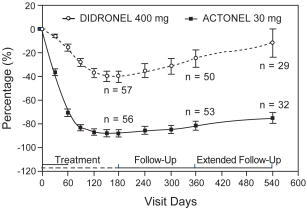 At Day 540, 16 months after discontinuation of therapy, 53% (17/32) of ACTONEL-treated patients and 14% (4/29) of Didronel-treated patients with available data remained in biochemical remission. During the first 180 days of the active-controlled study, 85% (51/60) of ACTONEL-treated patients demonstrated a â‰¥75% reduction from baseline in serum alkaline phosphatase excess (difference between measured level and midpoint of the normal range) with 2 months of treatment compared to 20% (12/60) in the Didronel-treated group with 6 months of treatment (p<0.001). Changes in serum alkaline phosphatase excess over time (shown in Figure 6) were significant following only 30 days of treatment, with a 36% reduction in serum alkaline phosphatase excess at that time compared to only a 6% reduction seen with Didronel treatment at the same time point (p<0.01). Response to ACTONEL therapy was similar in patients with mild to very severe Pagetâ€™s disease. Table 6 shows the mean percent reduction from baseline at Day 180 in excess serum alkaline phosphatase in patients with mild, moderate, or severe disease. 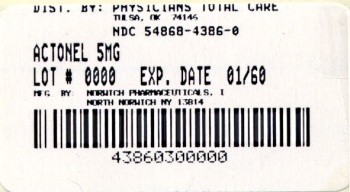 If one or both tablets of ACTONEL 75 mg on two consecutive days per month are missed, and the next month's scheduled doses are within 7 days, patients should wait until their next monthâ€™s scheduled doses and then continue taking ACTONEL 75 mg on two consecutive days per month as originally scheduled. If the dose of ACTONEL 150 mg once-a-month is missed, and the next monthâ€™s scheduled dose is more than 7 days away, the patient should be instructed to take the missed tablet in the morning after the day it is remembered. Patients should then return to taking their ACTONEL 150 mg once-a-month as originally scheduled. Patients should not take more than one 150 mg tablet within 7 days. If the dose of ACTONEL 150 mg once-a-month is missed, and the next month's scheduled dose is within 7 days, patients should wait until their next monthâ€™s scheduled dose and then continue taking ACTONEL 150 mg once-a-month as originally scheduled. ACTONEL may cause problems in your stomach and esophagus (the tube that connects the mouth and the stomach), such as trouble swallowing (dysphagia), heartburn (esophagitis), and ulcers. You might feel pain in your bones, joints, or muscles (See â€œWhat are the Possible Side Effects of ACTONEL?â€). You must follow the instructions exactly for ACTONEL to work and to lower the chance of serious side effects. (See â€œHow should I take ACTONEL?â€). to treat Pagetâ€™s disease of bone in men and women. The treatment for Pagetâ€™s disease is very different than for osteoporosis and uses a different dose of ACTONEL. This leaflet does not cover using ACTONEL for Pagetâ€™s disease. If you have Pagetâ€™s disease, ask your healthcare provider how to use ACTONEL. ACTONEL may reverse bone loss by stopping more loss of bone and increasing bone strength in most people who take it, even though they wonâ€™t be able to see or feel a difference. ACTONEL helps lower the risk of breaking bones (fractures). Your healthcare provider may measure the thickness (density) of your bones or do other tests to check your progress. Do not eat or drink anything except water before you take ACTONEL and for at least 30 minutes after you take it. See â€œHow should I take ACTONEL?â€. Dose-strength specific ingredients include: 5 mgâ€”ferric oxide yellow, lactose monohydrate; 30 mgâ€”lactose monohydrate; 35 mgâ€”ferric oxide red, ferric oxide yellow, lactose monohydrate; 75 mgâ€”ferric oxide red; 150 mgâ€”FD&C blue #2 aluminum lake.